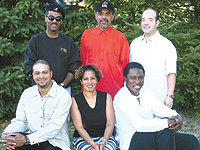 After nearly twenty years of playing together, which has included sharing the bill with Kool and the Gang and Blood, Sweat, and Tears, In Black N’ White still brings the energy of a young band trying to make a name for themselves. Last month, performing before an intimate yet enthusiastic crowd at Thai Joe’s, In Black N’ White demonstrated why they are one of the most enjoyable R &B/Reggae bands in the Milwaukee area. With lead singer Ernest Montgomery exhorting the crowd to shake their “asses n’ elbows,” the band had many in the crowd smiling, singing, and dancing the night away. In Black N’ White’s strength is that they take their music seriously without taking themselves too seriously. Unlike reggae legends Bob Marley and Jimmy Cliff, In Black N’ White is not focused on providing social commentary. In their set, even Marley’s politically-charged “Get Up, Stand Up” becomes a rollicking dance number. As lead guitarist Stuart Dove points out, the band has a great time performing together and they want their fans to have a great time as well. At the Thai Joe’s performance, with a nod towards the cheesy, the band dusted off Cameo’s Word Up. As the band jammed away, the audience sang along and loved every minute of it. Dove estimates that the musicians that comprise In Black N’ White have over 200 years of experience. However, the band is not afraid of change. Just two years ago, Lisa Weathers, lead female vocalist, was looking for a band to perform with. Listening to the band now, it is hard to imagine In Black N’ White without her. Weathers’ smooth vocals, combined with Montgomery’s soulful voice, blend well together and you’d think they had been performing together for years. In Black N’ White’s material, with original compositions as well as covers that span the past three decades, attracts more of an adult contemporary crowd, but they don’t do so by sacrificing their individual talents or toning down their music. Jack Jenkins, on bass, provided one of the highlights of the evening with an all-too-brief solo. And keyboardist Gerald Witherspoon energized the crowd when he left the keyboards behind and picked up his djembe drum. As the rest of the band ceded the spotlight, Witherspoon pounded out a strong, resonant beat to the crowd’s delight. Even as the crowd thinned near the end of the night, In Black N’ White continued to perform with vigor. Watching them on stage, the lyrics from an earlier Madonna cover, Music, seemed to aptly describe the band’s philosophy: “Music makes the people come together…And when the music starts / I never want to stop.” During In Black N’ White’s performance, the audience at Thai Joe’s left their problems behind as they witnessed a tight-knit group of friends do what they like to do best — play music. For more information about In Black N’ White, including upcoming shows, check out www.inblacknwhite.com.